Basking in the glory of a first class train ride up to Manchester from London - only four pounds more than standard fare, madness - I was greeted by rain as soon as I arrived at Manchester Piccadilly. Welcome to the North. 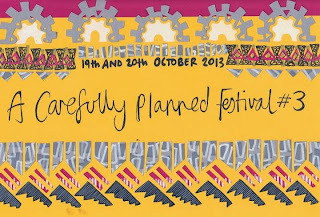 And welcome to the third edition of A Carefully Planned Festival. Here's how we got on with our first visit to the festival, and hopefully not our last. First up were London duo Playlounge - a band yet to excite me on record but one that did hold my attention with a visceral set in the dank surroundings of the Soup Kitchen basement. They also have a band member called Saam. (Although his name's actually Sam, so not sure what's going on there.) Sliding away from the sticky basement floor with difficulty, I made my way over to Gullivers for the spirited Runaround Kids. The mathy three piece, with duelling screamy vocalists, reminded me of Tall Ships - a pretty favourable comparison seeing as I have enjoyed the latter whenever I have caught them live. They were both sweaty and chatty, a somewhat endearing combination - especially when trying to peddle their records from the glorious display case of a Morrisons plastic bag. Mat Riviere, on the other hand, was not so chatty. Indeed, he was looking rather morose in the curious setting of the Bakerie Wine Store - which was a bit like a nice Pizza Express. Despite his experimental sound, it was obvious he was suffering from various technical difficulties. He was sad, I was sad, we were all sad. I had planned on heading elsewhere after Riviere's performance but Richard and Laura of popular beat combo This Many Boyfriends (more on them shortly) persuaded me otherwise. So it was down to Durham acoustic political-punk duo ONSIND to impress. Which they duly did, ably assisted by a rabble of almost crazed fans, shouting along to every lyric. Despite being slightly worried for my safety, it was pleasing to see a band delivering such a resonant performance. Somehow I found myself in a Wetherspoons not long after this - my Northern friends complaining of drinks prices, HAVE YOU EVEN BEEN TO LONDON? But soon, it was the turn of This Many Boyfriends to take the stage at the Night & Day Café, where their indie pop went down a treat. They played a new track, which is perhaps the best thing I've heard from them, suggesting promising things for 2014. Rounding off the evening, I waited for Sheffield six-piece Screaming Maldini to complete one of the longest soundchecks I've seen in recent history. They had the good grace to thank the audience for our patience however, and sent us away happy with a triumphant rendition of their pop smash, 'Summer, Somewhere'. Day two of A Carefully Planned Festival was a truncated offering as I had to leave to visit Glasgow to film something, which unfortunately I can't tell you much about just yet. I did however pack in the excellent Jeremy Deller exhibition at the Manchester Art Gallery and the terrific Manchester Museum before I left. Oh and a few more bands. Among Brothers were one such act, a lunchtime start at the Soup Kitchen being no barrier to their energy. A band whose sound encompasses the orchestral and post-rock, their quiet/loud dynamic was certainly an early wake up call. I felt a slight sense of emotional distance within the admittedly impressive musicianship but the performance was nevertheless engaging throughout. With the venues in Manchester so close together, it seemed wise to quickly nip round to the Night & Day Café to catch Fuzzy Lights even though I'd already missed half their set. Which was a shame as I found their mix of delicate folk and noise rock quite intriguing. Certainly more so than my final band of the fest - the well-named but somewhat lifeless Base Ventura, who sadly had an over-reliance on sci-fi effects and reverb. 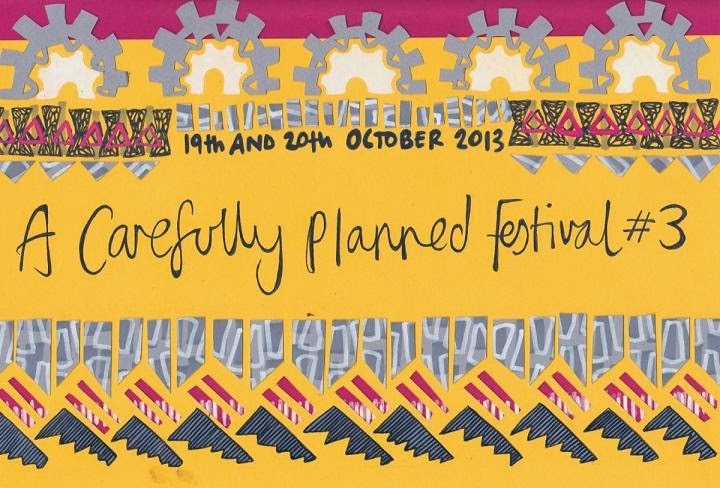 Despite the disappointing end to my festival, I thought A Carefully Planned Festival 2013 was very much a success. And appropriately named. Hopefully the festival will return next year, with another strong line up of new music at a bargain price. Find more info at Facebook. Want to discover more new music? FADED GLAMOUR is sponsored by MATERIAL, a free service that helps you find stuff you'll love based on what you already like. Just sign in with Twitter or Facebook and whether you're into music, fashion, design or film, MATERIAL will deliver you a personalised collection of news, stories and videos straight to your phone in two daily editions. Download MATERIAL from the Google Play store and Apple store.